Listening to Steely Dan and the Beatles whilst consuming industrial amounts of mind-altering substances was not only a thing in the USA and western Europe. In the Soviet Union, hippies and bohemians organised themselves in a loose network called Sistema. “The system” allowed them to meet like-minded individuals all around the Soviet Union. The Sistema hippies hitch-hiked across the country, meditated and drank tea brewed from cigarettes meant for asthmatics. Among them were many ‘hairy ones’ from the Baltics. Estonia boasted an active rock scene, whilst the environs of the Latvian village Gauja formed the backdrop for annual hippie summer camps. “There were hippies in all the major cities of the Soviet Union, but the Baltics were definitely particularly lively”, says Estonian documentary maker and anthropologist Terje Toomistu, “They had more access to western influences – especially Estonia, due to its contact with Finnish television.” In her colourful documentary Soviet Hippies, Toomistu explores the history of Sistema and meets up with survivors of the movement. Where did you get the inspiration for Soviet Hippies? Several of my influences and interests came together in this film. When I was a young teenager, the hippie era fascinated me. Its revolutionary potential and the way hippies questioned the existing social system still resonates with me. Aged fourteen, I fell in love with Jim Morrison and I listened to a lot of music associated with the era. During those days, the late 90s, a war was being waged on the streets of Paide, the small town in central Estonia in which I grew up. It was a conflict between the “hairy ones” and the “shaven-headed ones”. Several of my bohemian friends were beaten up by douchebags. Only after finishing the film did I realise that those incidents might also have left a mark on me. The initial spark to start my research came – surprisingly – in Indonesia. I was shooting a documentary and got acquainted with these totally strange men in their 60s, living outside of Indonesian society. My friend [the Estonian artist] KIWA told me that there were similar characters living in Estonia. I suddenly remembered an Estonian book called School for Magicians by Vladimir Wiedemann. He would later become one of the protagonists in the film. School for Magicians completely shifted my understanding of the late Soviet era. I grew up in post-socialist Estonia, and history books framed those days as a dark time when nothing good happened. But Wiedemann’s book showed me that there had been hippies in the Soviet Union and that blew my mind. Your film shows that they were listening to the Beatles and reading Kerouac’s On the Road, just like their western counterparts. How did they obtain this illegal music and literature? It was mainly bootlegged, exchanged or sold on the black market. Let’s say a Finnish tourist would visit Estonia and bring a couple of records. Or someone had relatives abroad who sent packages. The first generation of Soviet hippies were usually the sons and daughters of powerful families – for example, their parents might have worked for the KGB and so had the opportunity to travel abroad and brought back all this cool western stuff. It surprised me initially, but perhaps the Soviet hippies knew even more about Western music than their Western peers. They were utterly fascinated by it. The Estonian poet Johnny B Isotamm described it well when he said “in a vacuum, even a fart is air”. A record was a holy thing that would go from hand to hand, recorded over and over on reel tapes. Soviet hippies had to be imaginative, so they stripped telephone booths for parts to improve their guitars. How else did that typical Soviet inventiveness manifest itself? Colourful cloth for bell-bottom trousers was in high demand, so the hippies used curtains, which had flowers and all kinds of amazing patterns on them. Official tailors would turn them down, because pants couldn’t be wider than 30 centimetres. Hippie tailor Aleksandr Dormidontov – Sass in the documentary – probably made bell bottoms for half of the Soviet Union’s hippies. In a way, Sistema itself was an important part of that inventiveness. It allowed hippies to connect with others during their travels. Which kinds of jobs did hippies have during the Soviet times? Hippies generally liked those jobs in which they weren’t ideologically positioned. Many of them were responsible for keeping fires going to heat the houses. You could spend the night there, tending the fire and reading books. Those were intellectual hubs. Some hippies worked as night-watchmen, for example, at zoos or graveyards. Again, there they could sit in their box, drink tea and read. Everyone needed to have a job, but there were ways to work around that. You could have a job according to the book, when you’d actually be hitchhiking. Many hippies took jobs that were mostly active in winter and took long travels in summer. They also attended rock concerts in Elva [a town in southern Estonia] and organised hippie camps in Gauja, as shown in your film. Where did you find all that beautiful old footage? That was my biggest challenge. I initially believed, with regret, that nothing had survived. First of all, because very few people had cameras back in those days, and secondly because a camera was the very first thing the KGB would seize. Nothing showed up for a long time, besides photos. But the longer I worked on the film, the more people got to know about it, and a few sources turned up. I found three rolls of material in a museum in L.A., which had bought an archive from St. Petersburg. Nice cuts of those are in the film. When we’d already made the rough cut, another archive turned up in Moscow. Were these events allowed by the authorities? The authorities didn’t support them in any way. Even though most Estonian rock concerts were given permission and happened within the frame of official youth culture, authorities used these festivals to harass hippies. During the Music Days held in Tartu in the early 80s, a bunch of hippies were dragged onto a bus, driven to what is now the Russian border and left in the forest. The militia subsequently released a pack of wolf-dogs to chase them. So, even if these festivals were happening legally, they still posed an excellent opportunity for the authorities to capture Sistema hippies. The hippie summer camps, on the other hand, were totally illegal. The camps in Gauja happened every year in a slightly different place, so the authorities wouldn’t know where the hippies were. At the very first summer camp, they managed to bivouac for ten days on a beach near St. Petersburg before the authorities arrived. Some of the hippies travelled onwards to Estonia and put up another camp. It all happened organically. The cast of characters in your film is extraordinarily colourful. Which stones did you have to flip over to find them? In anthropology, it’s called the snowball method. Every meeting led to recommendations on whom to talk to next. Wiedemann, and Juliane Fürst – my research adviser who has been researching hippies for a long time – gave me tips as well. When we first went to Moscow for shooting, I arrived two days before the rest of the crew. I thought I had an appointment with one hippie, but he had already invited a bunch of his friends. It was like casting – talking, getting to know them and putting our agendas together. 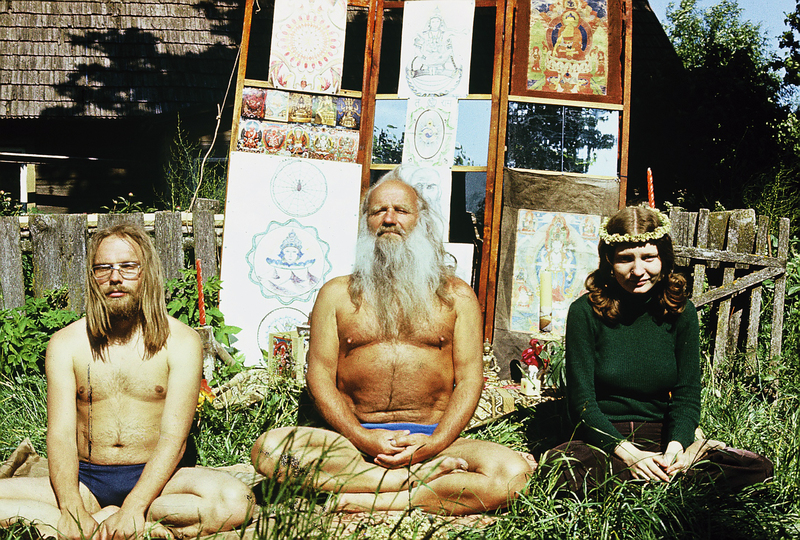 Did these hippies stay in touch over all those decades? No, they didn’t. The hippie movement ended with the Soviet Union. When the Soviet Union collapsed, Sistema followed suit. The new borders between the states halted the free flow of people. The end of communism meant the start of a different sort of struggle for survival. The hippies had to find new jobs and make a living. Social media has instigated a revival of Sistema. Facebook and the Russian social network VKontakte are connecting people anew, which happened also during the making of the film. The revival helped me a lot with finding archive material and staying in touch with people. It’s ironic that the collapse of the Soviet Union – and the freedom that came with it, the freedom the Soviet hippies had been craving for – also meant that their community fell apart. The western hippie movement was quickly eaten by social change and other movements – hippies became punks or yuppies. In the Soviet Union, ironically, stagnation somehow gave the movement the necessary framework to last for generations. It allowed hippies to live cheaply, to travel, to collect bottles and survive. The protagonists in your film seem to be very authentic hippies. They stayed true to their ideals many decades after the last western hippie had combed his hair and put on a suit. Why was that the case? To be a Soviet hippie was a heavy, almost existential choice. Once a hippie, always a hippie. It was a choice that cut off many chances to have a regular life. Hippies were thrown out of university and didn’t have the chance to take normal jobs. It was a world that sucked you in. That’s not to say that there weren’t people who were able to go back to a normal life after – for example women who fell in love with a charismatic hippie, travelled with him for a couple of summers and afterwards went to university. I chose to speak to people who were, in some way, the leaders of their time. For many, being a hippie was a holy thing. It was their form of resistance – even if often they weren’t very conscious of it and simply wanted to have fun. Now, they do recognise that it was the beauty of their life, the soul of their existence and the only way they could’ve been honest with themselves. That’s why they have such a huge respect for their legacy. It was more of an engagement to be a hippie in the Soviet Union – am I summarising that correctly? Especially after 1971, yes. The Soviet authorities became concerned about hippies and wanted to catch them all at once. So it was like a trap, set up by the KGB, when thousands of hippies were arrested on 1st June, 1971, during the first public hippie meeting in Moscow. The authorities had the chance to gather their contact addresses and would go knocking on their doors, talking to their parents and sending notes to their universities. The men would receive invitations to serve in the army – always far away, near the Chinese border. These mass arrests pushed the movement underground. It was a serious thing to remain a hippie after those events. You knew in no uncertain terms that the authorities didn’t like you. Did the authorities dislike hippies because they showcased western attitudes, or did they actually think they were dangerous elements that had to be removed because they posed a serious threat to the Soviet Union? That’s a good question. I don’t think there’s one clear answer: it was a mix of both of those. Mostly, it was a moral question, related to notions of purity and cleanliness. The hippies were seen as the dirt of society. Long hair? Eww! Strange pants? Eww! There were ideological arguments as well, but they were mostly used as excuses to supress them. If authorities found a Solzhenitsyn book in one pocket [Aleksandr Solzhenitsyn: a Russian dissident novelist who wrote about the horrors of forced labour camps] and marijuana in the other, the hippie wouldn’t know for which one he was being arrested. Probably the book. There were arrests and rapes; a Lithuanian hippie committed suicide. One pregnant woman was arrested and gave birth in prison. The child died. The human consequences were very real. Most hippies experienced mental violence – harassment, forcefully having their hair cut, being called dirty. Those things happened a lot and you’d never know when. You could be simply smoking a cigarette and authorities would take you to prison, where you’d sit with insects and real criminals for a month. Not everyone was jailed, some were lucky, but everybody could feel the tension. There’d come a moment when you knew you were being watched. How did ordinary Soviet citizens regard them? Hippies could enter a bar in the late 60s and the whole crowd would shout “scissors! Scissors! Scissors!” This mistreatment didn’t only come from the authorities. A mother might worry about her son and send him to a mental asylum, just to be on the safe side. That’s how strong the ideology of the proper homo sovieticus was. Tom Peeters is a Belgian freelance journalist based in Estonia’s Summer Capital, Pärnu. He writes about the Baltics for various Flemish media, as well as on his Dutch-language blog.